Alice Scherer is the Secretary/Treasurer of the Society of Bead Researchers. She is also the founder of the Center for the Study of Beadwork and is an independent scholar studying indigenous beading traditions. The Society recently announced to its members information about the new Munsell Bead Color Book. Here Alice shares with us the background for the creation of the book and how it will be used in the field. When classifying a bead, one of the most important characteristics to look at is a bead’s color, which must be documented in order to compare different beads. In the past, this process was made difficult by the lack of readily available tools for identifying colors. Through the years, bead researchers have used a number of identification systems, some quite expensive and others not widely available. The most optimal way to identify a bead’s color was to use the Munsell Book of Color, but due to price, this fantastic resource was not accessible to everyone. The solution? To create a more compact, affordably priced guide specifically for identifying bead colors. The Munsell Book of Color is a very large resource, but what was necessary was a smaller version only containing the most common bead colors found in archaeological sites and in ethnographic pieces. 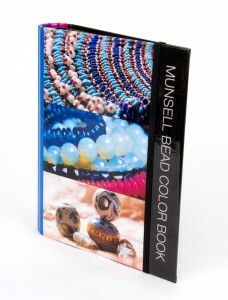 In 2011 Munsell set out to create a bead color book that could be used by archaeologists, art historians, bead and beadwork scholars, and others. The Bead Color Book is similar to Munsell’s Soil Color Charts, Plant Tissue Color Charts and Rock Color Chart, offering a smaller, more portable set of information on bead colors alone. The Bead Color Book is also more affordable, allowing even students to be able to own this resource. Compiled by myself and Karlis Karklins with help from Laurie Burgess, 176 colors were compiled spanning the spectrum of color. The Munsell Bead Color Book is organized by the Munsell Color Notation and then by the Munsell Color System values of Hue, Value and Chroma. Using the Munsell Bead Color Book is not complicated at all. You should use a teasing needle (found in scientific supply houses) and the bead being examined should be held on the needle against a white background. If you are examining beadwork, first find the color you think most like the bead you are trying to identify, then place the hole next to that color over the beadwork to see what matches the best. The color of beads should be determined when possible in natural daylight or the closest to it. Both incandescent and fluorescent lighting subtly alter bead colors which may give you false readings. Beads may need to be cleaned to determine the color of beads. Glass beads often need to be moistened to bring out their true color. It is common practice that they be dabbed with a bit of saliva. (Not contaminated by food or drink, of course!) For beads of other materials, deionized water may be used to clean the beads and is often used on glass beads as well. If glass beads appear to suffer from glass disease, then saliva will be the better choice. Founded in 1981, the Society of Bead Researchers is a non-profit scientific-educational corporation. The goal of this society is to foster research on beads of all materials and periods and to expedite the dissemination of the resultant knowledge.